I've been on the lookout for a from-scratch chocolate cake recipe that is both moist and full of just the right amount of chocolate (this one is also fabulous if you like a more dense, rich cake). While I really like this one a lot, it does contain a cake mix and I am trying to eliminate partially hydrogenated oils (in mixes, pre-made frosting, Jiffy, etc.) from our diet when possible. With the genes I am up against, I feel it's time to become more aware of our family's food intake. So anyway, I think I found a recipe that fits the bill. I served it with homemade whipped cream and I bet if you could find some great berries, it would be even more delicious. looks yummy! 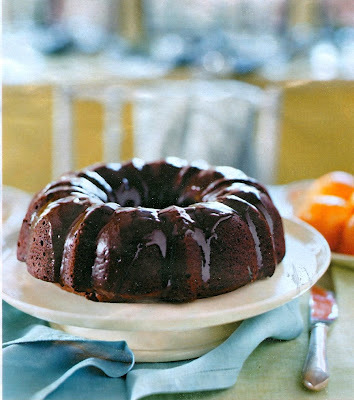 i don't have a bundt pan-- what kind do you use metal or silicon? I have used the recipe you posted that calls for the mix (our preference is to use mint chocolate chips!) but I am definitely going to make this new one next time. We are eliminating many of the nasty chemicals from our diet as well - we have no idea what kind of effect they will have on us in the long run....scary if you ask me! This cake looks mmm... good! Thanks for sharing. Thanks I use that a similar Cake Mix Recipe for a perfect Chocolate cake but I'm excited to try this new one! I"ve been thinking alot about hydrogenated oil as well as high fructose corn syrup, thanks for little reminders! By the way, what kind of pancake syrup does your family use? I would love to implement pure maple syrup, but the cost keeps me from really getting into it. The secret, I believe, for the moistness is the sour cream...at least in my experience. I could go for a slice right now! Rachel, we do use pure maple syrup. You are right...it is more costly but tastes so much better and is so much better for you! I buy the "Western Family" store brand as it's least expensive. Target's Archer Farms pure maple syrup is also cost-effective. We don't have pancakes & such as often but when we do, we certainly enjoy them! Oh, and I've trained my kids to not overdo it on the syrup :) That saves $ too.